Our visit to Derby is to be a quick one. Generally, we are dubious that it justifies a visit at all, but we eventually decide that since we are nearby we should take a quick squiz. There isn’t much to Derby these days but it has an interesting and black history, in both literal and metaphorical sense. We visit the old Boab tree which was used as a prison for Aboriginal people en route to Derby along with the longest cattle trough in the southern hemisphere. One of the astonishing idiosyncrasies of travelling in Australia is what totally boring structures we will visit as tourists. Not only that but Australian towns, cities and states have an insatiable appetite for promoting the totally mundane and nondescript as some form of towering heritage site or artwork. Inevitably they are also the biggest, longest, flattest, tallest, oldest, or whatever, in the world or the southern hemisphere. Or failing that the 5th largest in WA or the Kimberley or the west Kimberley or Derby or on the east side of School Road, downstream of the cross street drain and directly across from the general store. No matter what we can manage to turn some insignificant Australiana into a world attraction of astounding proportions. Perhaps that accounts for our view of Broome (see more later). One of the celebrated tourist destinations near Derby is Frosty’s pool which apparently was used by soldiers during WW2 to cool off. 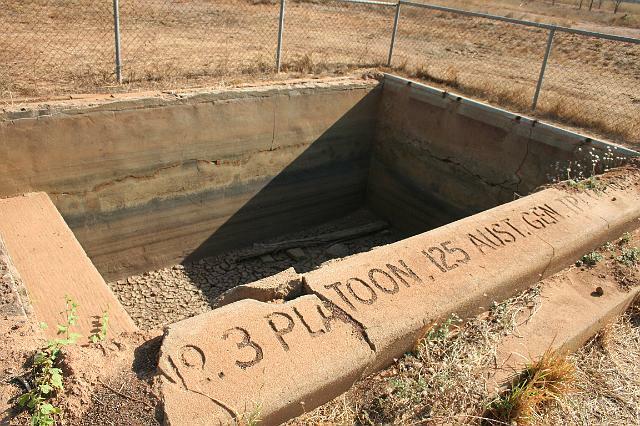 This magnificent and unmissable attraction is a concrete pool about metre deep, 3 metres long and two metres wide, made of concrete and just a few metres off the main road. Magnifique!! First stop, however, is the Mowanjum Aboriginal Art Centre which has a good collection of Aboriginal artwork and provides a history of Aboriginal dispossession and frequent relocation, which ended with many of the east Kimberley people living at Mowanjum. Lunch at Derby is at the cafe on the jetty. 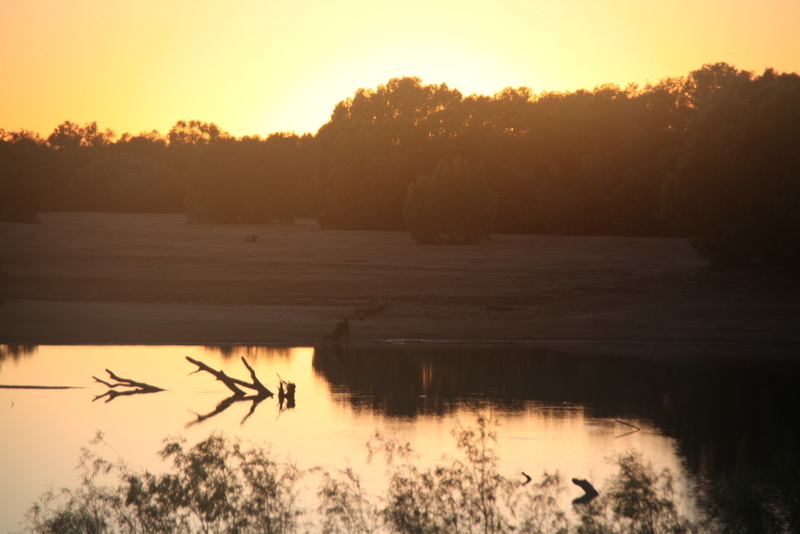 Derby sits on the Fitzroy River estuary and it’s location gives it the second highest tides in the southern hemisphere at around 11 metres on a king spring tide. 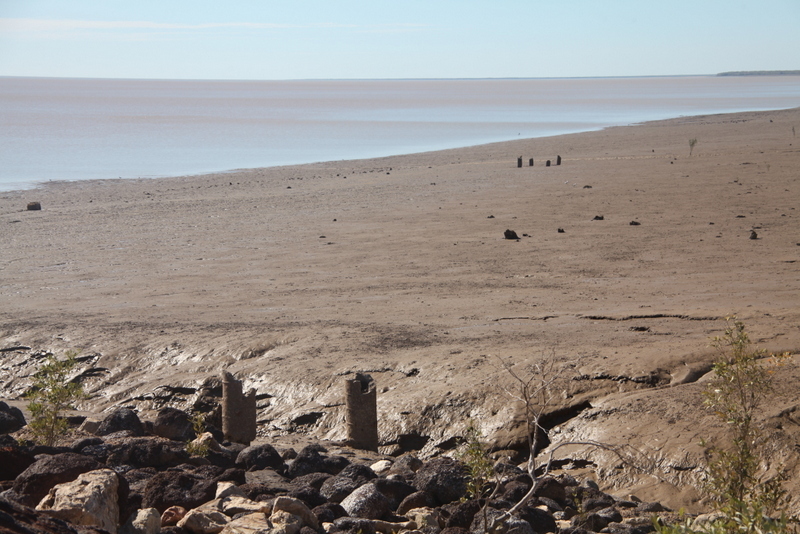 As a result the coast around Derby is a mud bath caused by the constant scouring and suspension of the fine Fitzroy River mud particles in the water. We stroll along the jetty and read of Derby’s history before heading off to shop prior to leaving for Broome. Shopping is one of the more problematic exercises of our joint trip, second only to parking the vehicle, so it seems. This time proves no exception. We have purchased both food and essential alcohol supplies and Kaylee takes them back to the vehicle while I, futilely, go in search of more reading glasses having managed to lose, sit on or otherwise damage all my reading glasses. I have purchased a seemingly endless supply of reading glasses over the last few weeks but am down to my last pair. I return to the vehicle reading glass-less. I can only surmise that (a) few people read, in Derby which, maybe, is not surprising when you observe the population; or (b) they are all blind and require a magnification of 6.5; or (c) the population of Derby is an outlier that has also perfect sight requiring only magnification of 1. But no reading glasses between 1 and 3.5, are available at any rate. My return is just in time to witness the end of a shopping dispute. Kaylee has been putting the shopping in the back of the car; Roger on the other hand doesn’t agree that it should be in the back of the car and insists on removing everything Kaylee has carefully loaded in the back to the front. In doing so he absolutely refuses to listen to any of Kaylee’s protestations that all will fit easily and securely. Apparently Kaylee is unable to understand Roger’s view that the gin or tonic will automatically self-destruct in the spots she has picked for them and so Roger has taken over. There is much under breath muttering occurring. 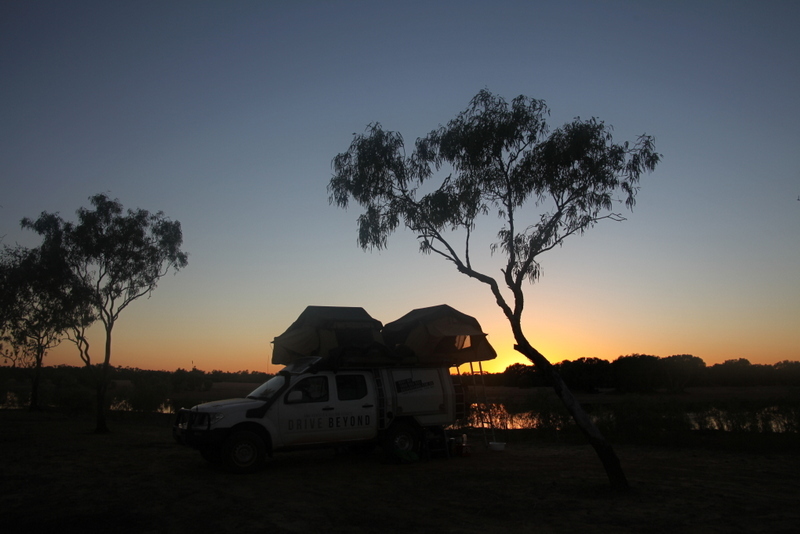 We leave Derby for Broome in the late afternoon having decided to camp along the way. 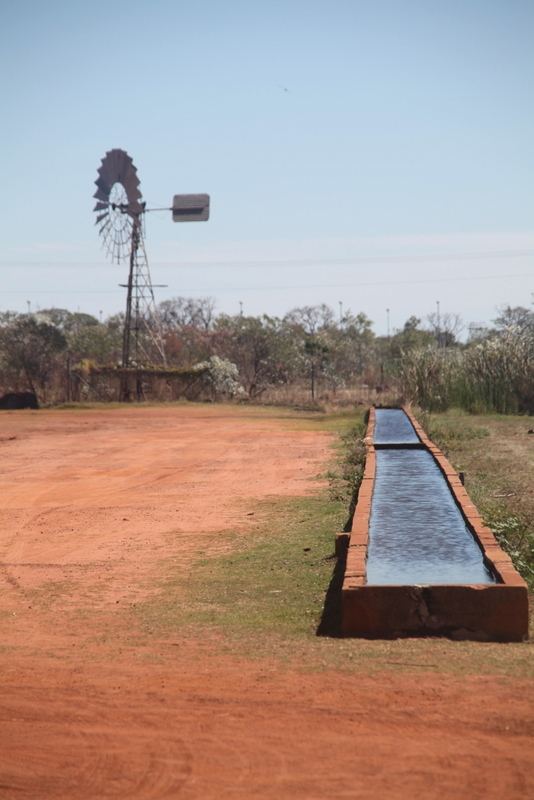 Our choice was a section of the Fitzroy River on a pastoral property, about 60 kilometres south-west of Derby. We pass through a couple of gates and eventually end up on a beautiful stretch of the Fitzroy River not far upstream from its estuary. Having parked, a celebration is in order since we have broken our collective record for parking having selected a parking spot and direction of vehicle within 30 seconds. This is definitely saltwater crocodile country and Jill has saltwater croc paranoia to world-champion levels, to add to some of the other concerns that appear to keep her in a perpetual state of elevated stress. I’m sure if we had a gun we would be required to keep an armed guard permanently on watch all night. This is even though Jill has retreated to the safety of the rooftop tent for the night. Even the lonely cow calling in the night is transformed into a croc grunting. Croc fears aside, it is a beautiful, peaceful camp spot with only three other camping groups most of whom seem to be at this spot for the fishing. We pass a relaxed evening around the fire. As a part of the evening festivities Jill performs a ceremonial burning of the Ngurr burr she has found. This is a local noxious weed and the burning is part of our small contribution to maintaining the local environment but I am unconvinced it will play a significant role in the eradiction of the Ngurr burr. I guess if everyone did the same, it would. Given the direction the Abbott Government is going, the Government could think about recycling some old Chinese policies such as the one child policy which would help with education and medical costs and could direct that everyone kill one cat, one cane toad and one Ngurr burr/salvinia plant/mimose plant (pick your noxious weed of choice) each day. This would quickly bring the trade deficit, the budget and the feral week/animal problem under control in one easy set of policies. The morning brings more precedents for our travelling circus. I wait until Roger is not looking and spray the zip of the tent housing with WD40. Roger doesn’t agree that this will work due to the propensity for WD40 to attract dust. So I need to wait until Roger is not looking so that, if he is right, I can pretend I never used it and if he is wrong I can loudly proclaim his clear lack of understanding of the maintenance and the workings of WD40. We also have our first incidence of vandalism when Kaylee launches her expensive plastic tea cup from the tent to avoid the stress of having to carry it down the steps from her bed. As a result the cup loses its handle and is therefore designated, by her, as my cup rather than hers. We are packed and ready to head to Broome by 8.30. Kaylee is concerned about her lack of fitness for her coming 1000 kilometre walk, so sets off to walk a few kilometres before we catch up with her. I observe her 1.5 km is probably not sufficient preparation for a 1000km walk with a 20 kg pack. This leads to me being in the doghouse again since, it seems, I am insufficiently supportive, despite the accuracy of my observation being bleedingly obvious. Broome seems a good option at this point.